Globe Telecom Chief Technology and Information Officer and Chief Strategy Officer Gil Genio (extreme left) underscores the need for government support in developing telco infrastructure and harnessing the full potential of the ICT industry during a Philippine Trade Summit panel discussion organized by the British Chamber of Commerce Philippines. 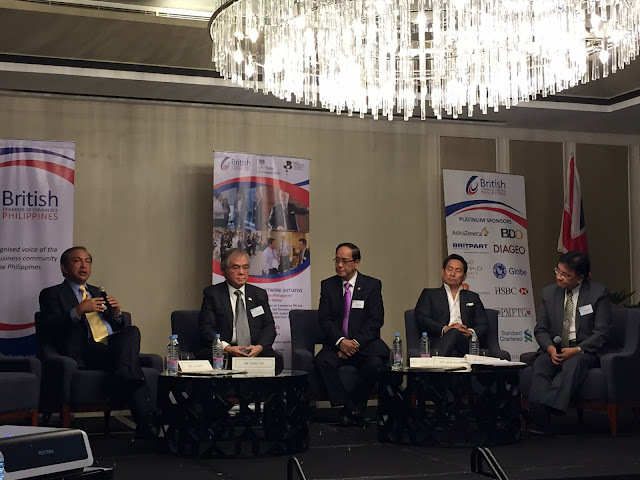 Genio emphasized that while Globe is ramping up network investments, government support is critical in rationalizing the permitting process for telecommunication infrastructure such as cell sites and fiber cables, claiming Globe needs to secure at least 25 permits to construct one cell site. Genio is joined in the panel by (from left) Samie Lim, Chairman Emeritus, Blims Lifestyle Group, Senen Perlada, Department of Trade and Industry export marketing bureau director; Mike Toledo, Head of MVP Group of Companies Media Bureau; and Cielito Habito Chief of Party, USAID Trade-Related Assistance for Development (TRADe) Project, who was the event’s moderator.